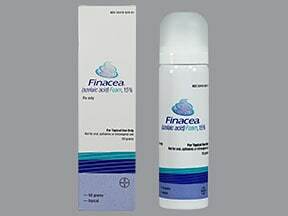 This medication is used to treat a certain skin disorder known as rosacea, a type of adult acne. It helps to decrease redness, swelling, and the number of pimples caused by rosacea. Apply this medication on your face as directed by your doctor, usually twice daily. To avoid irritation, avoid contact with your eyes or inside the nose or mouth. If you accidentally get this medication in your eyes, flush well with cool water. Call your doctor if eye irritation does not go away. Before use, wash the affected area with a mild soap or soap-free cleanser and pat dry. Avoid using other skin care products that may irritate your skin, such as astringents, abrasives, tinctures, cleansers that contain alcohol, and products that cause skin peeling. Shake the container well before each use. Use your fingers to apply a thin layer of medication over your whole face (cheeks, chin, forehead, and nose) and gently massage the foam into your skin. Wash your hands after each use. Makeup may be applied after the medication has dried. Do not use any dressing or covering on the treated area unless directed by your doctor. Use this medication regularly to get the most benefit from it. To help you remember, use it at the same times each day. Do not use more of this medication or use this drug more often or for longer than prescribed. Your skin will not improve any faster, and your risk of side effects will increase. What conditions does Finacea Foam treat? Skin burning, stinging, tingling, or itching may occur. If any of these effects last or get worse, tell your doctor or pharmacist promptly. Rarely, some people have had unusual loss of skin color (hypopigmentation) after using this medication. This side effect may be easier to see in people with dark skin color. Tell your doctor right away if you notice this side effect. List Finacea Foam side effects by likelihood and severity. This medication may pass into breast milk, but is unlikely to harm a nursing infant. Consult your doctor before breast-feeding. What should I know regarding pregnancy, nursing and administering Finacea Foam to children or the elderly? To help manage rosacea, avoid foods or liquids that may bring on redness, flushing, or blushing of the skin (such as spicy foods, alcohol, hot drinks). Store at room temperature away from heat and open flame. The contents of this can are flammable and under pressure. Do not puncture or burn the container. Keep all medications away from children and pets. Are you taking Finacea Foam? Are you considering switching to Finacea Foam? How long have you been taking Finacea Foam?